Call 01420 558855 or email us for advice about our products and services. 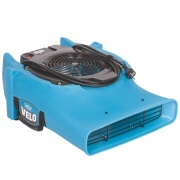 High performance air movement in a compact airmover? The new Velo delivers just that, and more: high velocity air movement, ultra low amp draw and five drying positions. Dri-Eaz combined these features with easy cleaning, versatile application and legendary U.S.-made quality to make one of the most effective Dri-Eaz airmovers ever built. And with an amazing 85% less power consumption and carbon footprint than comparable products, the Velo helps to reduce your impact on the environment. Up to 85% lower energy and emisions than snail blowers. Engineered airflow outlet for faster, consistent drying. Versatile drying with 5 operating positions. Stackable low profile, save space on the van. Kwhr counter included, know your true costs. Easiest to maintain. Simply remove fasteners and lift out impeller assembly for cleaning. Great portability. Easily carry two Velo at once - or stack up to six on a handtruck. Durable. Rugged rotomolded housing with new easy-carry handle - laboratory-tested to lift four times the weight of the Velo 5000 times without failure! Can't find what you want? Please contact us.